Lately, latex mattresses have set the world on fire with their appealing appearance as well as their superior properties. If you’re making a mattress purchase decision, you’d probably hear someone praise latex mattresses. We have slept on a wide variety of the different latex mattresses that are available on the market today. In this in-depth guide, we will walk you through the many aspects of a latex mattress to help you pick the right one for your needs. 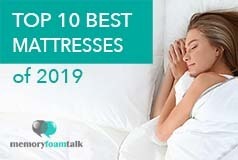 To see our list of overall Top 10 Best mattresses, follow this link! 1.What Is a Latex Mattress? In spite of the fact that memory foam mattresses are often considered the “Kings” of the mattress world, latex mattresses have gained popularity over the last few years. While memory foam mattresses are popular in the US, latex mattresses are much more popular in Europe. According to some customer satisfaction surveys, latex mattresses are only surpassed by memory foam mattresses. Latex is a natural material harvested from rubber trees and is used in various products like gloves, balloons and mattresses. Synthetic vulcanized rubber was created to supply the latex shortfall during the World War II. Since there are various types of latex as well as latex mattresses, consumers often find themselves in the midst of confusion. These natural benefits of latex which also include the lack of heat retention are all attractive features that make latex mattresses popular. All-Natural latex mattresses are also perfect for those who are striving towards a more sustainable or organic lifestyle. The Avocado Green Mattress is an example of an organic latex and innerspring coil hybrid mattress that is very popular these days, as is the Brentwood Home Cedar mattress. The Zenhaven mattress is made up of 100% natural Talalay latex and is another great option. Like an old saying goes: a coin has two sides, so latex mattresses offer many superior benefits while they also have a couple of off-putting traits. Keep in mind it’s impossible for a mattress to suit everyone, so start with its pros and cons and decide if it’s going to be a good choice for you. As mentioned above, a natural latex mattress is capable of providing a cool and natural bouncy feel, durability, and lots of health benefits for its users. Besides this, latex mattresses that are certified organic & natural do not contain metal or harsh chemicals. One of the best things about latex mattresses is their ability to provide ultimate comfort to their users. When you first lie down on a latex mattress, you’ll experience a soft sinking sensation and the mattress will conform to your body’s contours. However, instead of sinking down like you would with a memory foam mattress, your body will be immediately supported with a buoyant feeling due to the natural springiness of latex. This feature helps promote proper spinal alignment and pain relief, and since your body weight is distributed evenly, this also improves your blood circulation. No rubber trees have to be cut down in order to harvest rubber milk. We still have them purifying the air and water while giving us latex saps at the same time. Natural latex requires the minimum amount of chemicals during its creation while organic latex does not even require synthetic and artificially-produced fertilizers . The lack of impurities (petrochemicals, fire retardants, fillers, etc.) sets latex mattresses apart from other mattresses on the market. These harsh components can cause headaches, respiratory problems or itchy eyes. Latex mattresses are generally solid and firm which makes them resistant to bed bugs and dust mites and ideal for sleepers with back pain. The ability to balance the temperature according to your body’s temperature also sets latex mattresses apart from other types. With a latex mattress, you won’t sleep too hot or too cold anymore. Natural latex mattresses are also known for their longevity. Latex mattresses won’t soften too much and sag in places over time. Therefore, they won’t become less comfortable and supportive. As latex is naturally springy material, latex mattresses have more bounce and responsiveness compared to memory foam mattresses which can cause some motion transfer between couples sharing a bed. Many latex mattress manufacturers allow their customers to customize their mattresses to their specific needs. This feature is exceptionally beneficial for couples as it allows them to have their own sides customized to their individual firmness preferences, or it allows them to choose the firmness level simply by flipping the mattress over such which is a typical feature of the Zenhaven mattress . Latex has its own specific smell, but it is all natural. It’s not a harmful chemical odor since there are no petrochemicals. Compression issue – More common with thinner synthetic latex hybrid mattresses such as the Casper and Leesa that can compress under heavy sleeper weight and combined weight of couples who share the bed. Excessive weight – Natural latex is a lot heavier than synthetic latex due to its natural composition and high density. The floppiness in structure of latex makes their heaviness even more noticeable. Firmness – Many people feel that Latex mattresses are more on the firm side and it takes some time for the body to adapt to the firmness. This can be a pro or a con, depending on the individual preferences. Firmness is determined by the Impression Load Deflection (ILD). The higher it is, the firmer the latex is. Expensive – With all the costs of growing rubber trees to manufacturing latex and everything in between, no wonder that natural latex is expensive. That’s also the reason why so many latex mattress manufacturers take advantage of the term natural/organic to empower their marketing campaign. Latex Allergy – Some people are allergic to natural latex. There are 4 types of latex foam: natural latex, organic latex, synthetic latex and blended (hybrid) latex. Natural latex is made from the sap of rubber trees so it is chemical-free and contains no synthetic counterparts. The production of natural Latex is complicated and expensive so you can expect to pay a lot for an all-natural Latex mattress. If you’re buying a natural latex mattress, ask for proof (certifications) that it is 100% natural. There is also organic latex made from the sap from rubber trees that have been grown organically, meaning without using pesticides. So basically organic latex is natural latex, but more eco-friendly and healthy. 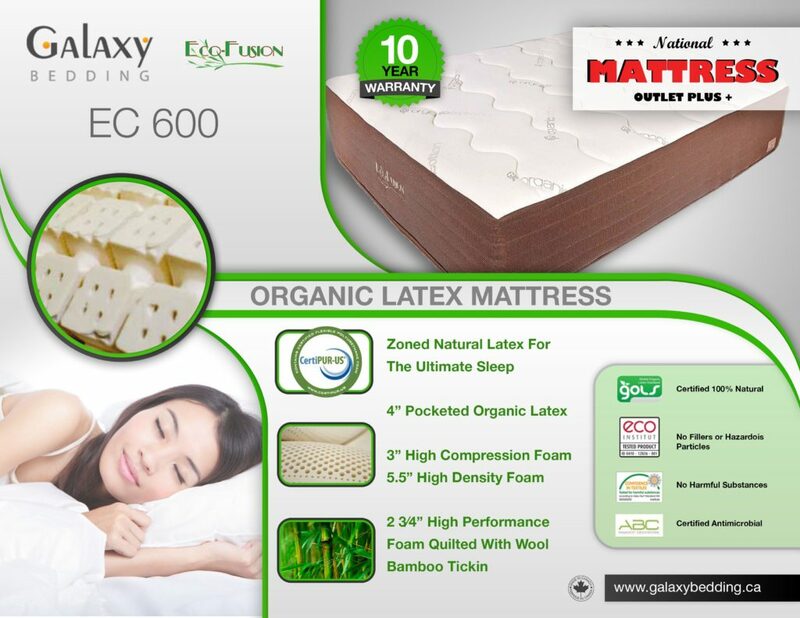 An organic latex mattress must have a GOLS (Global Organic Latex Standard) certification. Synthetic latex is made from Styrene Butadiene Rubber which has some superior advantages over natural latex, like softening over time which does not influence their durability. However, in terms of comfort, support, spinal alignment, longevity, natural latex wins. Blended or hybrid latex is a combination of natural Talalay and synthetic latex. Blended latex can last longer and contains less chemicals than synthetic latex. It also comes in various firmness options and is cheaper than natural latex. The ratio of natural to synthetic latex is usually 70/30 or 60/40. The more natural latex the mattress contains, the more expensive it will be. In addition, we would like to talk about 2 different ways of making latex mattress foam, the Dunlop process and the Talalay process . Dunlop is considered the traditional processing method, while Talalay is a bit more modern method of latex production that involves 2 extra steps. These two differ in what feel they give to the latex foam feel. Particularly, Dunlop latex feels firmer while Talalay latex feels softer. This is also the reason why Dunlop latex is used as a base core component while Talalay latex is used as a top cushion comfort layer. An example of an all Dunlop latex mattress is the Spindle mattress vs. the all Talalay latex Zenhaven mattress. Latex mattress manufacturers offer 3 different types of latex mattresses to their customers: All latex mattress, Latex over memory foam mattress, and Memory foam over latex mattress. Each has its own advantages and disadvantages. Every part of the All-latex is made from 100% of latex (natural, organic or synthetic). It provides good motion isolation and exceptional orthopedic support. However, All-latex mattresses are generally more expensive. (The Zenhaven mattress or Spindle mattress are examples of all-latex mattresses). The type of Latex over foam mattress has a multiple layered design with the top layer made of latex and the bottom layer made of memory foam. This arrangement relieves back pain and eliminates motion transfer. Since the top layer is latex, there is little to no smell/off-gassing. The Foam over latex mattress often has very little latex in its design to cut costs. Latex mattresses are in general firmer than many other kinds of mattresses. This is true to a certain extent as the more natural latex is, the firmer it will be. For example, Talalay latex is softer because it contains more synthetic latex. However, never confuse firmness with hardness. Personal preference – The first and most important factor. Some people like the feel of latex and that of sleeping “on top of” their mattress and the floating sensation, while others like more the fell of sleeping “in” their mattress, which is typical for memory foam mattresses. Sleeping positions – You should also consider your sleeping positions, whether you prefer to you sleep on your back, your stomach or your side, or you practice all three sleeping positions. 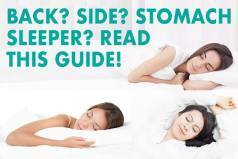 A side sleeper may want a mattress with a more plush feel that cradles and supports their shoulders and hips without causing the appearance of pressure points. A back sleeper or stomach sleeper commonly would choose firmer mattresses so their legs and lower back don’t sink too much during sleep which can cause stiffness. ILD (Indentation Load Deflection) – Mattress manufacturers use ILD as an indication of firmness, the higher the ILD is, the firmer the latex mattress will be. Like we always preach, firmness is largerly weigh dependent. How firm a mattress feels has a lot to do with your weight. Softer mattresses tend to get compressed under heavy weight. 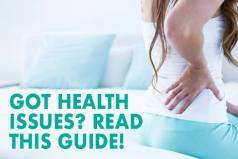 The mattress has to be firm enough to provide proper spinal alignment. Higher profile mattresses usually distribute the weight of heavier sleepers better. Cooling effect – Pinholes are designed to make the mattress sleep cooler and enhance their hygiene as they allow moisture and heat to escape and air to circulate freely through them. Firmness – Pinholes play a significant role in determining the firmness level of the latex mattress. Aside from the materials used, the number, size and arrangement of pinholes in certain parts of the mattress help create a specific level of firmness and comfort. These are called comfort zones and they can help make different parts of the mattress feel more or less supportive depending on the body part which is supported during sleep. A cover is what wraps up your mattress and contributes to its overall comfort and feel. Generally, there are 3 types of materials used in mattress covers: cotton (organic and conventional), wool, and polyester. Covers that are made up of 100% cotton (preferably organic) are most ideal due to their softness, breathability and numerous health benefits. Some brands such as the Brentwood Home Cedar use fancy New Zealand Wool in their exterior covers, while other brands such as the Zenhaven use organic cotton in their covers. All mattresses on the market have to pass the Federal flammability test in order to protect their sleepers in case of fire. In many mattresses, fire retardants are made from harsh chemicals. The best thing about natural latex is the fact that it is naturally flame resistant, hence there is no need for additional chemical compounds. Certifications are documents that demonstrate the real origin as well as the quality of the mattress. They help clarify any misleading information about the process of creating the latex mattress. Make sure the bed is certified before you make any purchase decision. GOLS: Legally certified organic to US standards. Oeko-Tex and Eco Institut: Certified that there is no hazardous chemical involved in the production. Natural latex can last up to 4 decades, so if you’re looking for an all-natural latex mattress, the warranty should be no less than 10 years,. Some retailers offer a 20 year warranty. Trial periods generally vary from 30 days up to 200 days, depending on the mattress retailer. So ensure you make the most of it and take advantage of sleep trial return period is the mattress is not to your liking. Prices vary greatly depending on the brand, latex type, distribution model, etc. Mattresses from well established brands are generally more expensive than those from recent entrants to the market. Some premium in-store latex mattresses can cost up to $5-10,000 or more. Some brands that offer 100% latex mattresses are Spindle, Zenhaven, and PlushBeds. Latex hybrid mattresses include ones such as Zonk’d, Leesa, GhostBed, and the very affordable and comfortable Awara mattress. Latex and innerspring coil mattresses include the Avocado Green Mattress and the Brentwood Home Cedar. Nowadays, you can buy a new latex mattress online at a fraction of the price of the in-store mattress brands. However, this option does not allow you to try out the mattress before buying it. However, most online retailers offer free trial periods so it’s no longer such a big deal and the price is so much better compared to purchasing in a store. We hope this guide on what to look for in a latex mattress and the many options and choices available on the market today is helpful to you if you decide to buy a latex mattress. In the end, you often get what you pay for, so choosing a 100% all natural latex mattress will cost more than a latex foam hybrid, but it will last much longer and provide you with a much better overall value for your money. The recent boom in online mattress retailers has also significantly lowered the cost of purchasing an all latex mattress, with prices that are 20-25% lower compared to the prices of the mattresses in stores. If you have any questions, feel free to ask and we’ll do our best to answer them! The Zenhaven, manufactured by Saatva, is made up of 100% American sourced Talalay latex and comes in at a fraction of the price of the in-store latex beds. It is 10’’ thick and offers two firmness options in the same mattress: Luxury Plush, which scores 5-6 out of 10 on the firmness scale (10 being the firmest), and Gentle Firm, which is around 7-8 out of 10. Both sides have the same cover and comfort layers and you can opt between the two firmness options simply by flipping the mattress over. The Zenhaven offers a buoyant and pressure-relieving sleeping surface and provides a nice degree of push-back and contouring to the body. It sleeps cool due to its latex nature and works well for all types of sleepers. Its cover is made of 100% organic New Zealand wool that serves as a natural regulator of temperature, aids in cooling, and adds to the overall comfort and luxuriousness of this mattress. If you want a luxurious, hypoallergenic latex model, made of the highest-quality, eco-friendly materials, then the Zenhaven is a perfect choice for you. It comes in at $1899 for a Queen size, but you can get the best price on the Zenhaven by using the link above. The Spindle is made of 100% natural Dunlop latex which can be customized to suit your needs and sleep preferences based on your questionnaire answers. It is unique in that the company sends it as a customized parcel of three latex layers, which you can assemble at home according to your liking. If it happens that the combination of the latex layers you have received does not suit your needs, Spindle offers the option to swap out the layers until you finally find those that will be perfect for you. The spindle offers a very comfortable top layer that is soft, but responsive enough to react immediately to pressure and ensure excellent pressure relief and extraordinary comfort without causing the feeling of being stuck in the mattress. The organic cotton and wool cover provides a luxurious and gentle feel thus contributing to the overall comfort that the Spindle mattress offers. Besides this, the wool wicks away moisture, and along with the latex layers, helps the mattress sleep cool and creates a cool and pleasant sleeping surface. With Spindle, there is no excessive motion transfer and it provides a nice amount of bounce, contouring, and support to the body which makes it ideal for all sleeping styles. The Spindle is priced higher than most mattresses we have tested due to its latex nature, coming in at $1349 for a Queen. However, this is a reasonable price given the quality materials used in its construction, and it is only a fraction of the prices of the in-store latex beds. You can use our code: talk5 and save 5% on this mattress. Awara mattress is a new luxury latex and coil hybrid mattress that recently hit the market and that uses eco-friendly and green materials in its construction. This bed is a 13″ hybrid mattress made of natural and organic materials such as the Dunlop latex coupled with premium coil springs specially designed to adjust to the unique curves of your body. The Awara comes in the “universal comfort” firmness option scoring 6,5 out of 10 on the firmness scale (10 being the firmest). The top comfort layer utilizes all-natural and organic certified Dunlop latex foam and does a good job at providing cool and contouring sleeping surface while having enough responsiveness and push-back to prevent you from sinking into the mattress too much. The mattress provides a good support from the pocketed coil foundation layer, with the latex top layer that provides more of a sensation of floating on top of the mattress compared to “sinking down in it” like memory foam. Naturally derived organic latex combined with premium coils perfectly fits your body’s curves and relieves pressure points while providing just the right amount of comfort and support necessary for all types of sleepers and all sleeping positions. The mattress also prevents the build-up of heat and sleeps quite cool due to its breathable cover, Dunlop latex foam, and the pocketed coils used in its construction. The Awara mattress is priced very well given the quality it delivers, and it comes in at $1299 for a queen, but you can also use our MFT200 coupon and save $200. Click here to read the full Awara mattress review. The Avocado mattress is a new luxury latex and coil hybrid mattress handcrafted in the USA without petroleum-based polyurethane foam, without toxic flame retardants, without dangerous pesticides, and without risk from volatile chemicals and gasses. It uses only green, eco-friendly ingredients in its construction and it is a blend of eco-friendly, natural, and organic ingredients that create a healthy, comfortable, supportive, and cool sleeping environment. This bed is also an excellent choice for those sensitive to off-gassing and those suffering from airborne allergies due to its all natural design that prevents any off-gassing and the appearance of dust mites. The Avocado has a soft cover made of all-natural latex, wool, and organic cotton, and offers an optional pillow top for those who prefer a plusher feel. The Avocado is an 11″ mattress which comes in at a 6 out of 10 on the firmness scale (10 being firmest) and provides exceptional comfort and support for all sleeping styles, as well as enough bounce and responsiveness coming from its latex and innerspring hybrid construction. This bed sleeps quite cool due to the latex materials and pocketed coil system used in its construction which allows a good airflow, prevents the build-up of heat, and eliminates the sticky sweaty feeling that some of the mattresses tend to cause. The wool and organic cotton used in its cover create a breathable surface, serve as natural regulators of temperature and aid in cooling to provide a cool and comfortable sleep. Coming in at $1399 for a Queen, it is a little pricier than foam mattresses but less than all latex mattresses in general. For an all organic, high-quality mattress this is a great price and surprisingly low given the luxury materials used in its construction.